Every aspect of Gregory Hull's painting process is physically and intellectually demanding. He frequently tones the surface of his canvases with a vibrant wash of alizarian crimson, forcing himself to quickly cover the dominating red color with broad strokes of thicker and more subdued oil colors. If his subject is a hired model, he works as quickly as possible to avoid taxing the model's patience. And if he is painting outdoors, he challenges himself to complete as many canvases as possible. With the high energy and passion Hull brings to his work, it's not surprising he has achieved an enviable record of success. The source of this energy is, in part, Hull's interest in physical fitness, but it also comes from a serious interest in art that began in high school and continued throughout his college career. He studied in European museums and completed graduate work in painting, drawing, and anatomy, devoting more than 30 years to developing his considerable talent. 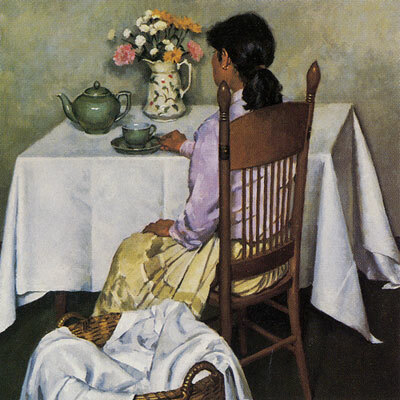 He has supported himself and his family by painting rich still lifes, figures, and landscapes. "Painting is a lifelong pursuit, and one hopefully changes and gets better," he says. "I want to always grow as an artist." When painting the landscape near his home in Arizona or Southern California, Hull almost always works outdoors, facing the 16"-x-20" or 20"-x-24" canvases mounted on a French easel. "I consider it a worthy goal to complete a painting entirely on location," he explains, "although sometimes it is necessary to take reference photographs for the details." He frequently arranges three or four day painting trips with close friends, where he creates as many as four medium-sized canvases a day. 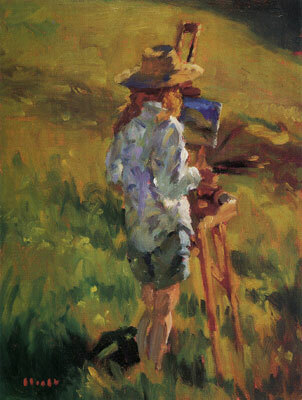 Hull is a member of the California Art Club and usually participates in the organization's events. "It always amazes me how a group of talented artists can look at the same location and all come up with vastly different but equally wonderful paintings," he remarks. "I recently made trips with Meredith Brooks Abbott. I met her 10 years ago on a plane to Venice, and we've been good friends ever since. We admire each other's work and inspire each other. 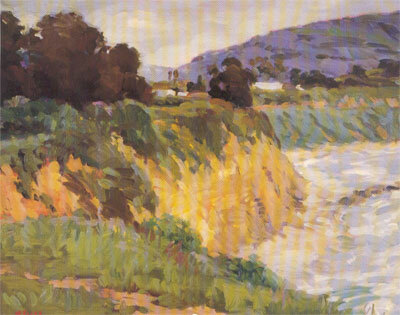 She knows of many great painting locations in Southern California, where the light is soft along the coast and there are a wide variety of subjects." While Hull is passionate about landscape painting, his still lifes have provided his main source of income over the past 20 years. From 1978 until recently, he was under contract to the Wally Findlay Galleries and produced paintings for their divisions in Beverly Hills (now defunct), Chicago, New York, and Palm Beach, Florida. "They took care of everything," Hull explains. "I just painted, and they handled the framing, publicity, advertising, and sales, and then sent me a check. I exhibited some landscapes and figures with them, but the galleries were most interested in showing my still lifes. In fact, they would sometimes advise me about the kind of objects they wanted me to paint and those they wanted me to avoid." The once tightly controlled relationship between Hull and the Wally Findlay Galleries ended with personnel changes at the galleries. While the separation was a bit challenging at first, Hull was finally free to explore a greater range of subjects and to exhibit with other galleries. That gave him the opportunity to show more of his figurative and landscape paintings - and to expand his repertoire of still-life subjects. The artist almost always works directly from his subject. Sometimes, however, he'll use photographs to remind him of details in a landscape or of a portrait client who can't pose as often as Hull would like. "My preference is to finish a painting in one long session so everything blends together and captures my feelings at the moment I'm seeing the subject. I don't even like using small location sketches as the basis of larger studio pictures," he says. 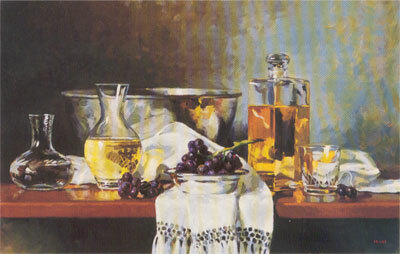 Still-life arrangements are usually set up in Hull's Sedona, Arizona, studio under a north-facing window. "There's only one source of light as I block out all the other windows in the studio except the one facing north," he explains. "I stand on the left-hand side of the room so the uniform light falls across the objects I've arranged on a table under the window. I try out different vases of flowers, china bowls, copper pots, fruits, pottery, and fabric in a shallow space in front of neutral backgrounds, and then I begin painting. I sketch the outlines of the forms with thin paint rather than draw them with graphite or charcoal. In a workshop I attended with Joseph Hirsch, he advised me against making a precise drawing, suggesting I make big gestures as I moved the brush around the blank canvas. Once I'm satisfied with the placement of shapes, I begin the process of refining the still life by painting smaller and smaller areas, always sharpening edges and accentuating the value pattern." The process of painting figures is quite similar, although the pose will vary depending on whether the subject is a hired model or a portrait client. "If I've hired a model, I ask him or her to take a variety of poses that feel comfortable, and I observe the movements." Hull explains. "As soon as I see something interesting, I ask the person to hold that pose as I select a canvas with the dimensions and proportions that would be most appropriate. I usually stain the canvas with ultramarine so the cool undertones will show through on the strokes of flesh color. I work all over the canvas, refining the shapes and building from the shadows to the highlights. "The color used to tone the canvas is a complementary color that contrasts the general tone of the subject I intend to paint," Hull explains. 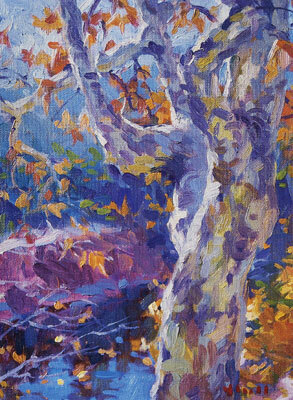 "Since landscapes are usually cool, I tone the canvas with a warm alizarin crimson. Figures, on the other hand, normally have a warm coloration, so I prepare the painting surface with a cool color like ultramarine." Hull is always interested in capturing a likeness in his model's face, even when the subject is a hired model. "The eyes are perhaps the most important part of a figure that faces the viewer, so I try to paint the entire face so it really looks like the person posing," he explains. "Hands and feet take a little extra attention because they are more complicated structures." Hull hasn't done a great many commissioned portraits, but he has painted the likenesses of judges, socialites, and well-known clients, such as Patty Hearst and John Mellencamp, with whom Hull shared painting tips when the rock star expressed an interest in learning how to paint. The palette of colors Hull uses in his studio include the following pigments: ivory black, a mixed white (Rembrandt titanium white plus zinc white), cadmium yellow light, cadmium yellow medium, yellow ochre, cadmium orange, cadmium red light, alizarin crimson, permanent violet, ultramarine, cobalt, cerulean, phthalocyanine green, and permanent rose. He does not use any other earth colors because he prefers to mix browns from other colors. 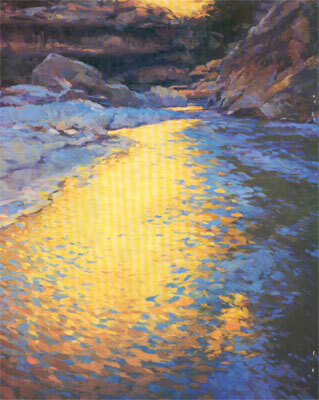 When painting small landscapes on location, Hull limits his palette to a few colors so he has less to carry and is forced to do more mixing. He takes alizarin crimson, ultramarine blue, cadmium yellow light, ivory black and the mixed white. Before he begins painting outdoors, he often makes a small ink drawing of the subject in a sketchbook to establish the composition. "I need to be sure I'm going to get all the important elements onto the canvas in the right scale and proportion, and I want to know how to balance the pattern of light and dark shapes," he explains. "Furthermore, I can fix the pattern of sunlight and shadow that will change during the two or three hours of the painting session." Once he has defined a subject on canvas, Hull will stop before the picture becomes too detailed or the brush marks get too smooth. 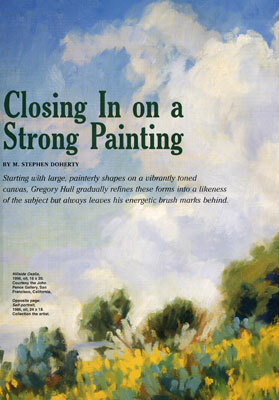 "I like the gestural, energetic quality of brushstrokes that appear in an oil painting," Hull says. "I try to stop painting before I lose that quality." 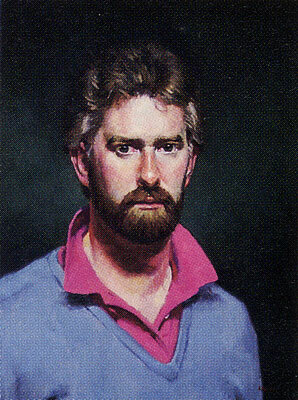 Hull completed both his undergraduate and graduate work at the University of Utah in Salt Lake City, where he studied with Alvin Gittins, a classically trained English portrait artist. 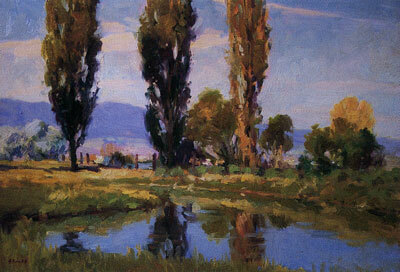 After traveling in Europe and teaching at his alma mater, Hull became a full-time professional artist in the mid-1970s. Since then his paintings have been shown in gallery and museum exhibitions, included in national juried exhibitions, and purchased by private and public collectors.